Brr! It’s cold outside! Richmond, VA is experiencing extreme cold like much of the United States, and we want you to avoid trouble with your plumbing that can be caused by frigid weather. When water in pipes freeze, the ice expands, creating as much as 2,000 pounds of pressure per square inch, enough to cause almost any pipe filled with water to rupture. The bad news is that a burst pipe can release hundreds of gallons of water per hour, possibly causing thousands of dollars in damage to repair. Exposed pipes that pass through unheated spaces, such as unfinished basements, can freeze and burst in cold weather. Water lines that are in less insulated spaces, or are distant from a heat source are also vulnerable. For many homes, bathrooms and laundry rooms are vulnerable to freeze damage – especially when water lines are run within an exterior wall. Being prepared and informed may help you to avoid the messy and often expensive issue of frozen pipes. R.J. Tilley, a Richmond, VA plumbing company, provides experienced service technicians and suggestions on how to prevent water pipes in the home from freezing, and how to thaw them if they do freeze. Close or seal crawl space openings and vents. Disconnect and drain all garden hoses. Winterize your irrigation system. Also drain the water out of any irrigation components that might freeze. Protect water pipes, drain pipes, and hose bibs with preformed foam insulation. For extra protection, install covers to protect hose bibs and outside faucets. Leave vulnerable faucets on to drip overnight when temperatures are the lowest. Open kitchen or bathroom cabinets where the water lines are contained within an exterior wall, allowing warm interior air in and around the pipes. Homes in the Richmond, VA region are not insulated to the same degree as homes in colder climates. So when extreme cold settles over central Virginia, no matter what steps you take, there is a chance that you could experience a frozen or burst water pipe. Shut off your main water valve immediately to reduce the amount of water damage. If you don’t know where your main water shut-off valve is located, first check your basement or crawlspace. The water line enters your home underground, so shut-off valves are commonly located in the corner of a basement or crawlspace where the main line enters your home. If the cut-off valve is not there, or if your home is on a slab foundation, follow the main line from wherever it enters your home. Sometimes the cut-off valve is located on the first floor of a home in a utility closet or laundry room. Then call R.J. Tilley for a prompt and professional repair. 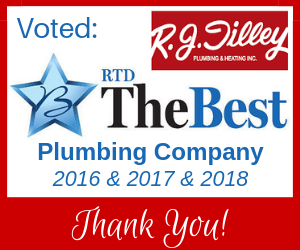 We look forward to serving your Richmond, VA plumbing needs!